Focus: Families are invited to participate in three 30-minute concurrent sessions in the Rediscovery Forest. Families are also welcome to tour The Oregon Garden on their own or ride the tram before or after the luncheon! Admission is included in registration. New this year! Inspector annual meeting and workshop. Inspectors that attend workshop do not have to pay for luncheon. Hosted by Tamara Cushing, OSU; Lauren Grand, OSU; and Mike and Connie Atkinson, OTFS inspection coordinators. 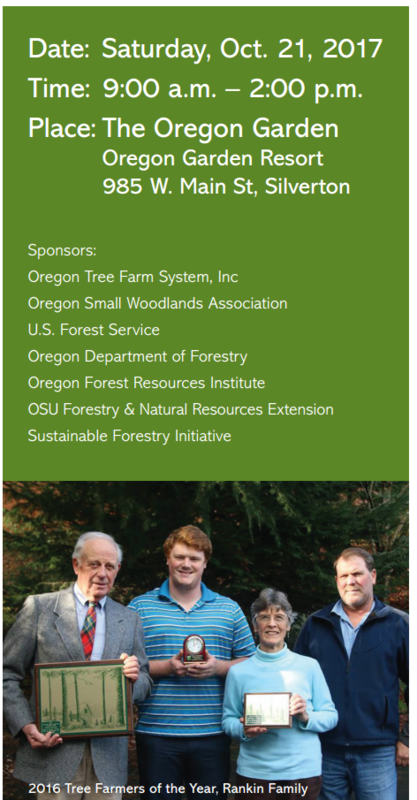 Focus: We will explore the wealth of information from the national woodland owner survey and discuss approaches for engaging more family forest owners in a meaningful conversation about their woods. Also, updates on certification requirements. Farmer of the Year for 2017. For more information, contact Jim James at 503-588-1813 or jimjamesoswa@yahoo.com. Download the complete OTFS Annual Meeting Flyer and Registration flyer here. Send your completed registration, along with fees, to the address on the back.